The more I learned the more I wanted to know. I learned a great deal about Alzheimer's disease and dementia--including the science. It helped me understand a very mystifying disease. It helped me to put a frame around something that is difficult if not impossible to describe. Learning how to communicate with a person living with dementia is not easy. It is, however, well worth the effort. When Alzheimer's strikes communication and behavior change abruptly -- overnight. It is up to the caregiver to adjust since the person suffering from dementia is incapable of the adjustment. Understanding this need is the first big step. 4. Are Alzheimer's Caregivers the Forgotten? I learned that people living with Alzheimer's or a related dementia are not the enemy, they are our loved one's. 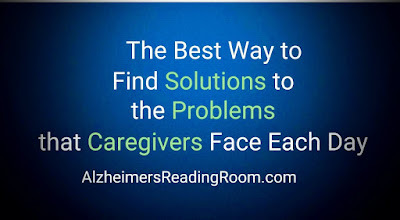 I believe changing behavior, understanding what is happening, and a willingness to change the communication dynamic are the first steps to Alzheimer's caregiver happiness. When a UTI goes undetected in an Alzheimer's patient they can become mean, delusional, dull, disoriented or worse. Undetected UTIs are common in Alzheimer's and dementia patients. I often get asked question about how I deal with my mother when she evidences erratic behavior. I knew the solution to the dreaded bowel movement problem for years. I couldn't get my mother to cooperate. When she wouldn't cooperate, I would give up. At least three or four times over a two year period. I was finally able to implement my solution for one simple reason -- I was learning new and better techniques as an Alzheimer's caregiver over time. "So many people get hung up on thinking, 'You're not the person I used to know.' That objectifies the person and distances you from them. It's saying, 'You're a problem' instead of, 'We're in this new place together." Should I put my loved with dementia in a nursing home or memory care facility? Sometimes while looking at all those stars I begin to look at the space between the stars -- I call this the Blue Nowhere...When I look at the Blue Nowhere, I begin to imagine all the persons suffering from Alzheimer's disease. The Blue Nowhere is very vast. Alzheimer's will try to rob the Alzheimer's caregiver of their spirit. It will try and send them into the black hole of depression. Every day Alzheimer's whispers in the ear of the caregiver -- give up. One of the biggest mistakes we make as dementia caregivers is to use too many words. In other words, we try and explain to persons living with dementia why what they are saying or doing is wrong. I often have family caregivers request medications to help people living with Alzheimer's and related dementia to sleep.